Palestinian hunger striker Khader Adnan is near death. Adnan, a 33-year-old Palestinian, has been on a hunger strike since December 18 after he was arrested in a nighttime IDF raid on his home in the village of Arraba, Jenin. Khader has been held without trial and charged, without any evidence presented, of affiliation with Islamic Jihad. Yesterday, an Israeli military court rejected Khader’s appeal. In his decision, Judge Moshe Tirosh disregarded Khader’s lawyers’ numerous arguments, including the lack of evidence that Khader Adnan has carried out any activities providing grounds for detention; that administrative detention is used in an arbitrary manner; and that affiliation to a political party is aligned with the right to freedom of expression, assembly and political association. Judge Tirosh further dismissed Khader’s claim that he was subjected to torture, inhuman and degrading treatment while in custody, adding that only Khader is to blame for his physical health deterioration and that his grave medical condition will not influence the court’s administrative detention decision. And so Khader remains chained to his hospital bed by Israeli authorities, despite warnings that his death is essentially imminent. Human Rights Watch has called upon Israel to “immediately charge or release” Adnan – a demand Israel stubbornly continues to refuse. Khader Adnan is but one of thousands of Palestinian prisoners being held in Israel’s practice of arbitrary imprisonment According to a January 1 report by Addameer, a Palestinian Prisoner Support and Human Rights NGO, there are currently 4417 Palestinians held as political prisoners, 310 of whom are being held in “administrative detention” without trial or formal charge. 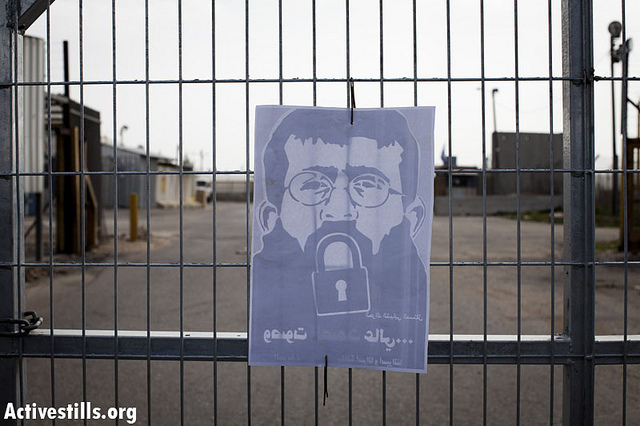 Khader Adnan’s struggle reminds us that nonviolence is not the easy choice. It is often the harder one. And there has been silence too from prominent voices such Nick Kristof, the New York Times columnist famous for using individual stories to draw attention to human rights abuses around the world. In a 2010 column titled “Waiting for Gandhi,” Kristof scolded Palestinians for not adopting nonviolent tactics. Of course Kristof was ignoring or simply ignorant of the rich history and present of such popular resistance in Palestine… Last Autumn hundreds of Palestinian prisoners spent weeks on hunger strike against punitive Israeli prison conditions, and many are on hunger strike now in solidarity with Adnan. But if Kristof and others claim to be “waiting for Gandhi” why haven’t they spoken up for Adnan? After all it was Mahatma Gandhi himself who when repeatedly imprisoned by the British famously used hunger strikes to draw international attention to his people’s cause. BTW: readers of this blog may remember the heartbreaking post I shared last December by Palestinian businessman Sam Bahour, who described the plight of his dear friend Walid Abu Rass. Abu Rass, Finance and Administration Manager for Health Work Committees (HRW) – one of the largest community health service providers in the occupied Palestinian territory – was taken from his home in front of his wife and two daughters at 1:30 am on November 22. When the judge confirmed his administrative detention order on 1 December, Walid’s lawyer filed an appeal, emphasizing that Walid is an employee in a humanitarian institution providing necessary medical services to many individuals and that his detention negatively affects his work and beneficiaries. He noted that Walid’s previous arrests were also all based on classified material and vague reasoning and that there was never any proof or official charges made regarding his alleged PFLP activity. The appeal was rejected by the judge on 15 January 2012. Addameer believes that Walid’s detention is also connected to his work with the HWC and their support of the prisoners’ hunger strike launched on 27 September. The HWC actively coordinated solidarity events and other support of the prisoners during their 22-day hunger strike. Furthermore, as the hunger strike was initially launched by PFLP members in prison, this affiliation may cast light on why Walid has been accused by the military judge of being active in the PFLP. This entry was posted in Human Rights, Israel, Palestine on February 14, 2012 by Rabbi Brant Rosen. Administrative detentions are surely at the top of the list of tools the Israeli military uses to intimidate, punish and insure that effective leadership of the Palestinian people never has a chance to gather. Why, o why, o why does this supposedly civil rights-loving American people and administration not get it? Are we just deaf or ignorant …. or just too absorbed with our own plight … which pales in comparison to people suffering this kind of punishment? Question – This is how Al Jazeera described Adnan: “Khader Adnan, widely believed to be a leader of the Palestinian group Islamic Jihad…” (http://www.aljazeera.com/video/middleeast/2012/02/2012212123512120636.html). A quick scan of their entry on Wikipedia shows a long list of terrorist murders they have accomplished. Doesn’t seem much like the non-violent resistance type to me. Am I missing something? Apart from the questions of Adnan’s political affiliation, it’s also worth noting that Irish hunger striker Bobby Sands was affiliated with the IRA, which was considered at one time to be a terrorist group by the British government. While in prison, Nelson Mandela also went on a hunger strike with other prisoners. He, of course, was affiliated with the armed wing of the African National Congress – also considered to be a terrorist organization by the South African apartheid regime. There are, I believe, important lessons to be learned here. Maybe you could analogize Hamas or Hezbollah to the IRA or the African National Congress, but I think Islamic Jihad is a fairly hard case to make. They are exclusively a terrorist organization. And nobody (or at least none of my Zionist friends) is claiming that Israel is a perfect democracy that always does the most democratic thing. That’s a straw man, and you know it. The occupation doesn’t render Israel any less of a democracy. The occupation is unquestionably bad. But it has no bearing on the form of government that Israel has. Israel is obviously a democracy. I’m certainly not going to argue with you in defense of Islamic Jihad. But I do think that Britain’s and apartheid S. Africa’s experiences with hunger strikers are instructive. On the issue of Israel’s democracy, I also won’t argue with you that the occupation in “unquestionably bad.” I’d go a bit farther and say it is unjust, illegal and patently undemocratic. This will be a long post because I have a lot to say on this subject, and I’m concerned that most people don’t think enough about it. I think it’s telling that you told me to start at 28 where Professor Ronald Dworkin says that his “tentative conclusion” is that “democracy must be secular. It cannot be religious, even if it is tolerant religious.” What I’ve realized from talking with people from different countries is that everybody is completely convinced that their model for church-state dynamics is the absolute right one and everybody else is crazy, undemocratic, etc, so I’m not totally surprised that you would assume that his first sub-conclusion is unobjectionable. In fact, it’s a very strong claim that I don’t think he defends effectively. I think he’s wrong. I’m happy to argue with Professor Ronald Dworkin. My response to opening to 28 and hearing that democracy must be secular was – What? How is that possibly true? What about half of Europe, that has established churches? He can’t possibly be saying that only France (and maybe the US) is a democracy. He briefly mentions England at about 15, claiming that it falls somewhere in between the Israel model and the France model. That would seem to mean that it’s also a “failed democracy, a compromise,” just less “failed” than Israel, but still a failure. But many countries in Europe have the cross on the flag and in the classroom. In England, certainly, Anglicanism is a part of the national culture (“God save the Queen”) even as its citizen religiosity rate is much lower than the more laique USA. Is much of Europe failed democracies? The deeper flaw in his argument is assuming that there is some essential definition of what democracy is. Any definition that tries to be comprehensive will inevitably fail to include many, if not most (or even all, in the case of the definition he posits) countries that are said to be “democracies.” In my opinion, a better way to do it is to go the other way. We’ll analyze Israel’s status as a democracy according to other countries in the world and see which way of government it best approximates. Israel is obviously not a theocracy. (If you want to argue that it is, go for it. I hope you’ll agree with me here.) Its citizens elect their leaders, and all adult residents living in Israel vote. (East Jerusalem is admittedly problematic, but I think it’s fair to say that it’s a sticky enough situation and local enough that it shouldn’t disqualify Israel from democracydom.) As far as the occupation, I’m fine calling it undemocratic and unjust (I don’t know from illegal), but if it disqualifies Israel from being a democracy, then the US is obviously not a democracy either. Every democracy has undemocratic elements (i.e. the Supreme Court). So in that sense, according to Dworkin, every democracy would be a failed democracy, and his argument is then trivial. One last thing. It was unclear whether his three prongs for why Israel is a religious state all need to hold for Israel to not be a democracy. One of them is the rabbinate. I’m 100% in favor of Israel disestablishing the rabbinate. It’s somewhat of a red herring, though, because if they did that, you would still think that Israel was not a democracy. His and your problem seem to have more to do with the general culture and official establishment than with the religious tyranny of the rabbinate. I’ll leave you with Joseph Weiler, another legal scholar who has done important work on the relationship between religion and state in non-US democracies. What I like about Weiler is his respect for pluralism among democracies. I think he makes an excellent argument for the validity of states with established religions. Richard, you are going into microscopic detail and missing the obvious. Throwing people out and then declaring that those remaining constitute a democracy is a sham. A democracy is for all. Here in the United States we treated the native-Americans shamefully, doing to them as Israel had done and is doing to the Palestinians, even in the details like denouncing them as terrorists, but at least they now have full rights as American citizens in what is truly a democracy. Israel is not, no matter how loudly it makes the claim. I only responded to what R. Brant posted. If I’m missing the obvious, so is he. But I can’t really respond to you because I can’t tell what you’re arguing. Is this an argument that Israel isn’t a democracy because of the details surrounding its founding or an argument that Israel isn’t a democracy because it doesn’t give citizenship to Palestinians living in the West Bank? If the former, it seems to strange to make an argument that a country’s process by which it rules itself fundamentally depends on its formation. Tat would be to argue that no country can become a democracy. If the latter, the US is not truly a democracy.